Monster Hunter 3 and Red Steel 2 sales, reviews, and play-time data. Red Steel 2 took 42 days from its release, to debut with data on the Wii's Nintendo Channel. Monster Hunter 3 took 14 days from its release, to debut with data on the Wii's Nintendo Channel. Red Steel 2 has 6,807 players reporting their play-time data, for its debut. Monster Hunter 3 has 6,870 players reporting their play-time data, for its debut. Red Steel 2 has 57,738 Total Hours reported for its debut on the Nintendo Channel. Monster Hunter 3 has 118,807 Total Hours reported for its debut on the Nintendo Channel. Red Steel 2 's Standard version Amazon.com sale rank is #527 and the current selling price is $46.99. Red Steel 2's WM+ version Amazon.com sale rank is #292 and the current selling price is $56.99. Monster Hunter 3 Standard version's Amazon.com sale rank is #60 and the current selling price is $44.99. Monster Hunter 3 CCP bundle 's Amazon.com sale rank is #755 and the current selling price is $84.98. Red Steel 2's review score average is 81.00%, based on 44 reviews. Monster Hunter 3's review score average is 84.96%, based on 26 reviews. The Monster Hunter 3 Classic Controller Pro bundle is currently sold-out on Amazon.com, and has been having supply issues before the game even released. Also, Monster Hunter 3's debut data, as for "Total Hours" reported, is the highest I have seen for a game's first debut on the Nintendo Channel. I think that Red Steel 2 debuting already, is a pretty good sign for the game, considering it doesn't have any sort of online functionality. If you have played both Red Steel 2 and Monster Hunter 3, what do you think of them? Are you playing more of Monster Hunter 3, as the data seems to show? Not bad for RS2, and obviously MH3 is killing it. I find it incredible that poeple are averaging 17+ hours played on a game taht is only two weeks old. RS2 was really fun to play with the WiiM+, but the missions etc. lost me towards the end and it grew stale. No replay value. MH TRI, I logged 35hrs the first 4 days I had it, I'm at 50hrs now and don't see an end in sight at the moment. It's the only game I play and I haven't touched my PS3 ever since. Welp... RS2 was a delicious apple and MH3 is a scrumptious orange. That said, I will be chowing down on this orange for months and months and months... it has so many layers.... maybe it's more like an onion? Maybe it's like a pomegranate because those take forever to eat but it's so rewarding. In conclusion .... I like both games immensely but MH3 is much closer to perfect. Haven't played RS2 but I am loving Monster Hunter. Crashman whats your hunter name, maybe we could play sometime online. I've played RS2 and haven't played monster hunter yet. Honestly I'm not sure i even have the time to sink that many hours into a game anymore. If one game can take the top spot from Brawl for most hours played per person it's Monster Hunter 3. It's incredible how long it takes to do so little, but it doesn't feel like a chore because it's so much fun to play. I've only played the game twice now and each time I stopped it felt like I was emerging from a deep sleep or something. Haven't bought Red Steel 2 yet, I think I'll wait for a price drop. The lack of real 1:1 sword fighting à la WSR Swordplay Showdown is a huge letdown. Also it doesn't seem like the structure of the game is fun. 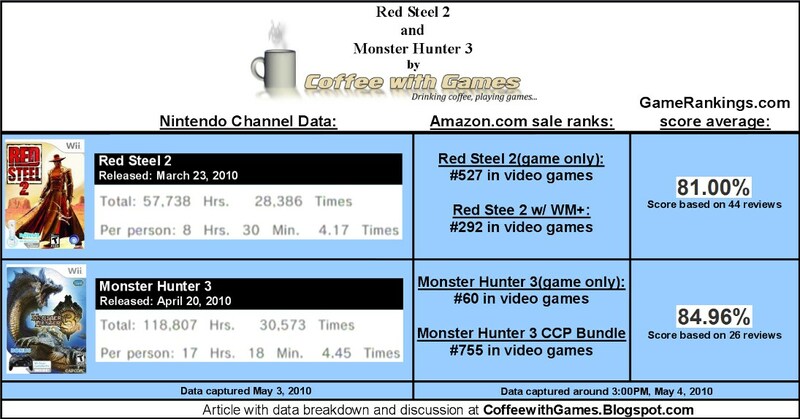 I think Red Steel is going to stick to around 8 hours while Monster Hunter keeps going up every week. drop me a line whenever! MH3 is a huge time sink. There is absolutely nothing wrong with sticking to games that don't take a lifetime to complete. I agree with crashman. They are really different experiences. Is Monster Hunter hurting RS2 sales? Maybe. But most comments I'm seeing indicate that people want RS2, but don't plan on getting it until the price goes down. 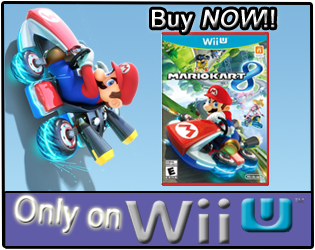 This seems to be the case for a lot of Wii games. I'm thinking Madworld, HOtd Overkill, Excitebots etc, probably are getting new fans everyday, as people are picking them up used or marked down. "I find it incredible that poeple are averaging 17+ hours played on a game taht is only two weeks old." Yea, the average hours are really good for a debut. It was only slightly behind COD:MWR's debut hours "per person", but it was ahead in the number of players reporting data. It was great playing with you the other night! Thanks for helping me complete that quest! Do you think if Red Steel 2 had online multi-player, that it would be more like the pomegranate? Hey, my in game name is "Coffee". I hope to see you online this next week! Have you completed Red Steel 2's campaign? If so, have you gone back to play it again on a higher difficulty setting? "If one game can take the top spot from Brawl for most hours played per person it's Monster Hunter 3." I think it's going to be very interesting watching Monster Hunter 3's hours the next few months. Like you, I haven't purchased Red Steel 2 yet, though I really do want to play it. I'm glad we have added each other, hopefully we can play together this week...I'll be working on leveling my hunter this weekend a good bit.
" 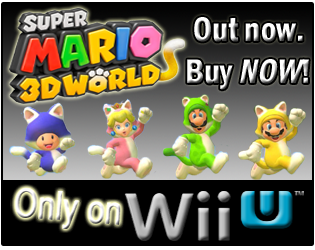 But most comments I'm seeing indicate that people want RS2, but don't plan on getting it until the price goes down." It'll be interesting to see if/when Red Steel 2's price gets cut...Amazon.com and I think BestBuy had both versions marked down by $10 a few weeks back, but it's back to normal now. What do you think a good price for RS2 should be? Thank you all very much for sharing your thoughts on this! I hope to see some of you in Monster Hunter 3 within the next week! Super Mario Galaxy 2's Data Debut!